Welcome to the darkened recesses of old school death metal. Firmly rooted in those hallowed traditions, we have one band who twist the sickening riffs and patterns of old even further, in their never-ending worship of the extreme. Names like MORBID ANGEL, AUTOPSY, PESTILENCE, CANCER: these are the gods of a depraved group of individuals from Newcastle, UK. Their name is HORRIFIED. For a start, the band are deceptively young and fresh: mastermind Daniel Alderson started it last year as a studio project, enrolling Sam Butterfield (guitarist of Hieroglyph) for vocals. 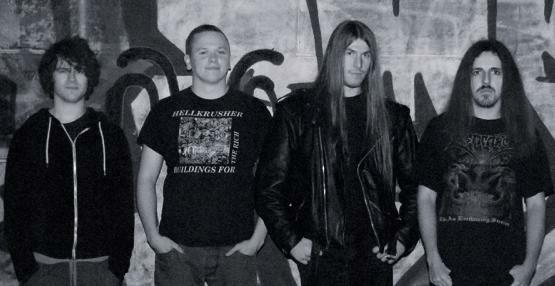 This resulted in the chaotic Carcinogenic Feasting demo, which was subsequently released on local DIY label Tombs In The Valley Productions/Torn Flesh Records. Their first ever concert was the first edition of Byker Grave, a highly successful if brief set which is available on YouTube. For their début album “Descent Into Putridity”, Dan steps up to the microphone, and despite being so young his vocals already resemble the throat-ripping snarls of Martin Van Drunen (PESTILENCE, ASPHYX) or Lars-Göran Petrov (ENTOMBED) circa Left Hand Path, although with Dan’s own demented treatment. The band are all deceptively young, and yet have already racked up an impressive amount of time in bands like PLAGUE RIDER, WINDS OF GENOCIDE, RISEN PROPHECY and VACIVUS. This lends a maturity to their sound, yet still with the vibrant urgency that this genre requires. The album is packed with encrusted riffs, wailing solos and pummelling drums: this is a reminder of why people fell in love with death metal in the first place.